Top English welterweight Jimmy Wallhead (25-8) has today joined Cage Warriors Fighting Championship’s stacked 170lbs division. Wallhead, currently ranked as one of the UK’s top two welterweights, will compete exclusively for CWFC for a minimum period of 18 months after inking a five-fight deal with the promotion. The 29-year-old began his career with Cage Warriors back in 2005, going on to compete under the CWFC banner on 15 occasions, more than any other fighter in the promotion’s 12-year history. The latest addition to CWFC’s highly competitive welterweight stable, Wallhead will be aiming to stake a claim for a shot at championship gold when he makes his Cage Warriors return at CWFC 68 in Liverpool on May 3 against a soon-to-be-announced opponent. “I’m extremely excited about my homecoming to Cage Warriors,” said Wallhead. “Cage Warriors was where I started and where I have some of the fondest memories from my career so far. “I’m in the best mental and physical shape of my life, so to come back to Cage Warriors to compete in a great talent-pool is an inspirational opportunity for me. A judo black belt and veteran of 25 professional victories, 18 of which have come via stoppage, Wallhead holds notable wins over several fighters with UFC experience, including Igor Araujo, Matt Veach, Che Mills and Frank Trigg. 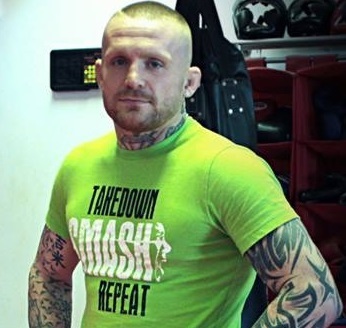 The Leicester native, who competed for Bellator on three occasions between 2010 and 2012, hasn’t been stopped in his last 20 outings, with his last loss inside the distance coming at the hands of current UFC star Dennis Siver back in 2006. See Jimmy Wallhead make his Cage Warriors Fighting Championship return on Saturday, May 3, at CWFC 68 at Liverpool’s Echo Arena! Tickets, priced from £30 plus booking fee, are available HERE.